"You can't go wrong with this Greek salad, especially if you remember the only and most important tip: toss it with the vinegar first before adding olive oil. If you don't, it will not taste as good. Which reminds me, giving the amounts here is very difficult, since this really should be made to your tastes, so please use the ingredient list as a very rough outline." Chef John's salad is so bold, so crunchy, and needs no overnight refrigeration! If you need to make this the day before, I suggest making the dressing separately, and then mixing everything before the event. I think this should only be dressed about 30 to 60 minutes before service for maximum enjoyment, but that's just my approach, and some folks prefer an overnight marination. Use 1/2 teaspoon dried oregano if you don't have the fresh kind. Between 4 and 6 ounces of feta cheese work well here. 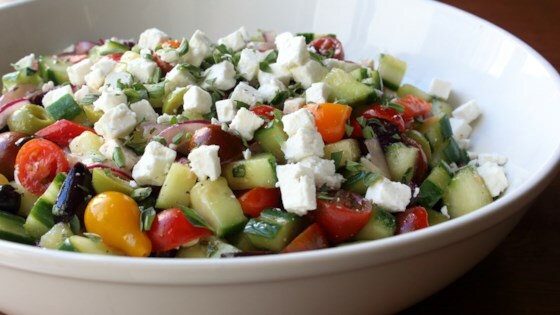 Wonderful Greek salad recipe. Made it as stated with the exception of the green olives. Mine had pimentos in them. I could have taken them out, but didn't. This is so delicious! I have made it many times and it always disappears from the fridge. It stays crisp even after a couple days. Super yummy! Husband raved about it. Added cooked chicken breast to it the next day for lunch - even better! I loved it. I also soaked the onions as I have trouble with the rawness of them. I would soak both for 15 minutes next time and let dry longer.